This week is National Vegetarian Week, which runs from today until Sunday 26th May. The Vegetarian Society suggests that being a Vegetarian is not rocket science - in fact, they think it's surprisingly simple - and so do I! The question that people ask me most often when they hear I am Vegetarian is "Well if you don't eat meat... what do you eat?" Some honestly think I live on the stereotypical lentils and vegetables. The answer is... I eat everything that meat-eaters eat - just without the meat, fish and animal products. Even some carnivores don't eat meat every day, or at every meal. There is an array of foods that Vegetarian's can eat. I eat from the protein, dairy, fats and carbohydrate food groups every day - not just the fruit and vegetable group. There are also great meat-free substitutes available which supplement the meat if you are missing it (and they are much better than they used to be). To demonstrate how simple being Vegetarian can be, this week, I shall be sharing some surprisingly simple Vegetarian recipes for you to enjoy. I hope to show that you don't have to be a budding Nigella to create a great tasting meal. Indeed, I am going to let you into a little secret here, most weekday evenings, I typically only have between fifteen and thirty minutes to get a meal on the table. Stuck in a never ending cycle of school pick-ups and after school clubs, we don't make it home until around 6pm most nights, meaning I have almost no time to concoct a restaurant standard Vegetarian creation. However, I also don't like to consistently feed my family pre-prepared meals as I like to make our meals from scratch as often as I can, or use a mix of pre-prepared and fresh ingredients. Tonight we had Tomato, Mozzarella and Basil Pasta which used a pre-prepared sauce, but also fresh ingredients too. Now I know that Pasta and Sauce isn't exactly revolutionary, but it is a great base to add fresh ingredients to, for a delicious healthy meal. I would typically add black olives to this dish to give it a bit more substance and flavour, or you could also add some vegetables - perhaps onions, peppers and courgettes to the dish - a great quick, surprisingly simple Vegetarian meal! Please see below for the recipe for Tomato, Mozzarella and Basil Pasta. I am also adding a linky to the bottom of this page, so please feel free to add your own surprisingly simple Vegetarian recipe to share with others this National Vegetarian Week. The Vegetarian Society also has some great surprisingly simple recipes on their website. You can keep up to date with National Vegetarian Week through Facebook/nationalveggieweek and Twitter @nvw2013. Please also come and facebook and tweet along this week with me. My contact buttons are in the sidebar on the right. Once again, Happy National Vegetarian Week 2013 to you all! 100g Mozzarella, cut into thin pieces. Cook the pasta in some olive oil and hot water for around ten to fifteen minutes. Once cooked, drain the pasta and add the tomato sauce and chopped tomatoes to the pan. Heat and then add the pasta and combine the pasta and sauce together. 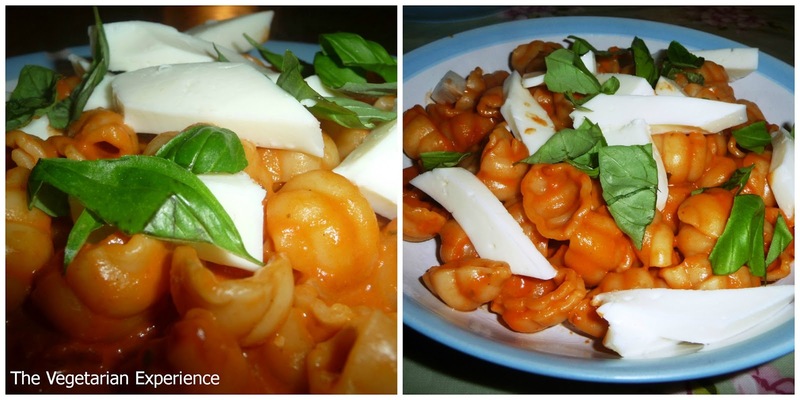 Place the pasta onto the plate/dish, and add the mozzarella and basil over the top of the pasta.